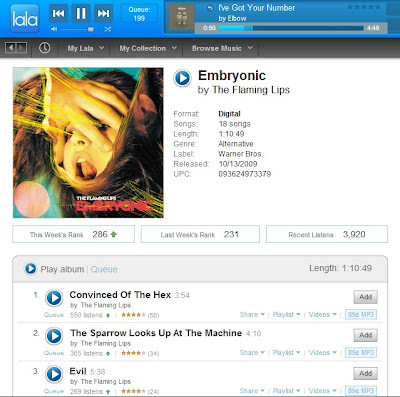 Lala is an online music service that, among other things, lets you create a free collection of music matching the songs you have on your hard drive. That means you can play all of your own music wherever you have access to Lala. Although the site has a clean design with some great features, it is missing some important functionality which impacts the overall user experience. The music player is fixed on the top of the screen so if if you're reading a long, scrolling bio page, the player controls are always visible. On the homepage, the call to action of searching for an artist is prominent and the search feature uses autocomplete, listing results really quickly. But the site lacks important functionality. While looking at the new Flaming Lips album, The only way to add the 18 songs to my collection was by using an 'add' button on each row. The screen does not provide a way to multi-select songs or 'select all', an efficient way to add multiple songs. However, when browsing my collection, I was able to perform actions like 'delete' and 'edit' on multiple rows. The inability to multi-select on one screen and overall inconsistent selection model may frustrate users while making learning for some new users difficult.